DVD Review: "Roberto Rossellini's War Trilogy"
Roberto Rossellini’s status as a father of neorealism is eclipsed by his notoriety as the father of Isabella Rossellini. His adulterous affair with Ingrid Bergman in the 50s touched off a Brangelina-sized scandal that filled the tabloids through their subsequent marriage, the birth of their three children, and divorce in 1957. That said, the extras are stellar, beginning with the essays included in the accompanying booklet. James Quandt, senior programmer at the Cinematheque Ontario in Toronto, checklists the basics of neorealism (location shooting, natural lighting, nonprofessional actors playing working-class characters, unadorned camerawork and editing, and documentary style) and shows how they don’t necessarily apply to Rome Open City, a film that started a movement but left its director dissatisfied. La republicca critic-at-large Irene Bignardi discusses the production of Rome Open City, set during the grim and suspicious years of the German occupation, which proceeded in fits and starts over several months as film stock and money ran low. 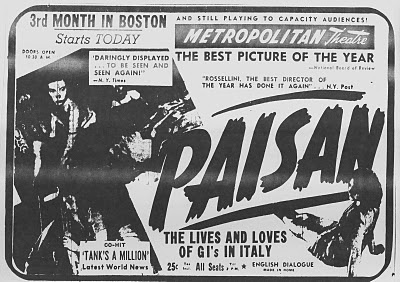 The “more real than real” quality of Paisan, an episodic film in which Allied troops and Italians congregate and clash during the liberation of the country in 1943-1944, is the focus of an essay by University of Pittsburgh professor Colin MacCabe. Finally, former Chicago Reader critic Jonathan Rosenbaum ponders the film Rossellini considered “a descent into hell,” the chilling Germany Year Zero, shot in the ruins of Berlin. The discs themselves contain much, much more; this set is the 500th Criterion has released, and the label has gone all out. 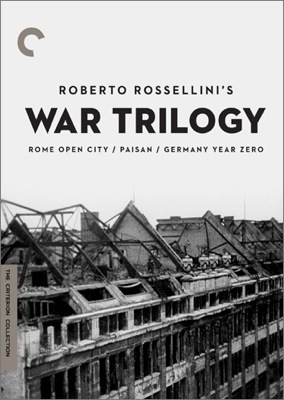 Content includes: Video introductions to the films by Rossellini, from 1963; footage from 1970 of Rossellini speaking at Rice University; a 2001 documentary on the director by Germany Year Zero assistant director Carlo Lizzani and a 2006 documentary about Rome Open City, featuring, among many others, Bergman, Scorsese, Francois Truffaut, Isabella Rossellini, and Federico Fellini (who co-wrote Rome Open City’s Oscar-nominated screenplay); Lizzani lecturing on Germany Year Zero at a 1987 conference; film scholar Tag Gallagher’s video essay about the trilogy; and film scholar Peter Bondanella’s commentary track for Rome Open City. My second favorite supplement is an illustrated essay by film scholar Thomas Meder that shows how Germany Year Zero was influenced by a German, the director’s then-mistress, Roswitha Schmidt; Rossellini really got around (Isabella and Guy Maddin’s quirky short film about him, 2005’s My Dad is 100 Years Old, portrays him as an all-consuming big belly) and the result, this time, was a landmark film and not 24/7 coverage. I most appreciated the video segments with Rossellini scholar Adriano Apra. There’s a knack to doing these things, and Apra has it, as he engagingly mixes facts with opinions. It’s not that the films are “difficult”—you get caught up in them quickly—but once one has concluded you’ll want some perspective on it. Rome Open City is probably the easiest to digest, maybe for the reasons Rossellini was fed up with it. 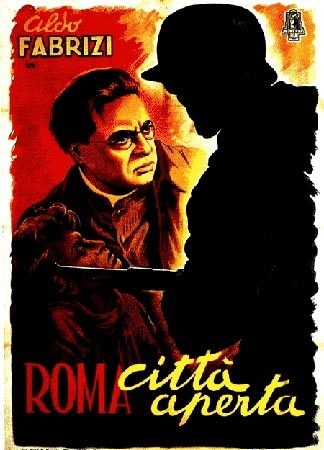 A story of struggle and resistance against the occupation, the film stars a pair of familiar faces, comic Aldo Fabrizi as a priest and the feisty Anna Magnani (an Oscar winner for 1955’s The Rose Tattoo, and another of Rossellini’s mistresses), and builds considerable suspense as the Gestapo closes in. Its moments of violence, including a blowtorch interrogation, are still shattering. Rossellini hit several nerves. Italian audiences used to more escapist films shrugged but the film was a hit overseas, which may explain why Paisan opens with the logo of MGM, the least neorealistic of Hollywood studios. The director threw away the crutches of stars and a forward-moving storyline in favor of vignettes, which begin with documentary footage of the Italian campaign. The stories range from humorous (a monastery unsettled by the presence of Protestant and Jewish soldiers) to profoundly stark, with an unforgettable finale. Most arresting is the segment focused on an African-American GI trying to communicate with an Italian boy, which in 20 or so minutes says so much more than Spike Lee’s tongue-tied Miracle at St. Anna (2008). Ingrid Bergman so admired Rome Open City and Paisan that she wrote Rossellini a fan letter, suggesting they work together. History shows the two got more than they bargained for, and Criterion might consider a box set of their interesting collaborations. For now it’s more than enough to experience what Bergman fell in love with in the first place.